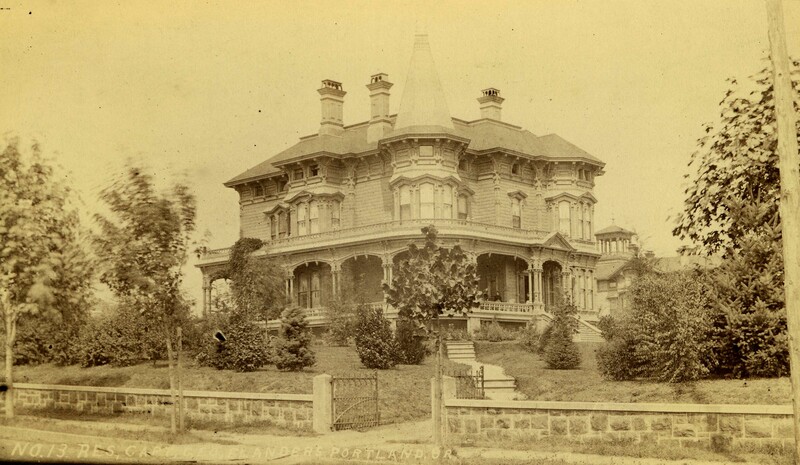 One of the grandest mansions in Northwest Portland was the home of Captain George H. Flanders which stood on the block bounded by NW 19th and 20th Avenues, Flanders and Glisan Streets. This view looks northwest from 19th and Flanders. Designed by Justus F. Krumbein and built in 1882, it was replaced in 1926 by the extant Temple Beth Israel. Much of the rock wall pictured here is still in place. Seen in the background is the belvedere atop the home of Cicero Hunt Lewis on the block between Glisan and Hoyt (now Couch Park). I didn’t realize the full scale of the house until I spotted the people near the front entrance to the right of the picture. Whoa, that’s a lot of heating in the winter. They sure built some magnificent houses back then. This one is incredible. Capt. Flanders was a brother in-law of Capt. Couch who developed this area from his original donation land claim. Capt. Flanders and the four Couch daughters were all given double blocks to build palatial homes on. Mrs. Hunt being one of those daughters. Others were the Wilsons and the Glisan’s. A fourth daughter never built on her lot but other members of the family later built smaller homes on her tract. This was a truly remarkable neighborhood with its magnificent Victorian homes. Sadly most of them were torn down in the 1920’s and 30’s. What a damned shame these mansions are now gone. I have no idea what they would be used for if they still existed, but I would love to have a tour. When the two Flanders daughters sold the house in 1926 they moved to a new home they had built on S.W. Arden Road. It still stands and contains several fireplaces and bookcases that were once part of this house.